Adams says that I'm nesting. I don't know, maybe I am. Last night, as I laid down in bed, my mind began to swirl with home projects. I silently reminded myself of all the things we needed to buy or needed to do... before... well? Before what? Maybe Adam is right. He usually is. Part of the reason for buying this particular home was that Adam and I could see ourselves living here 5 years from now... 10 years from now... 20 years from now! We knew that it would be a work in progress. So why then am I so freaking anxious to get it all done? As I laid silently in bed wondering why I was in such a hurry to tile our garage/washroom passthrough and build our new pantry among other things, I realized that Adam's jokes about me nesting were probably true. 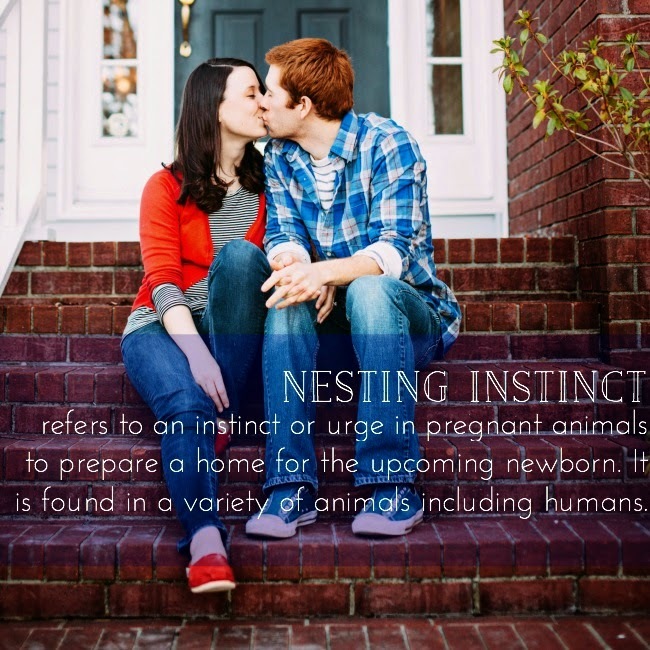 But how in the world can someone nest when they aren't even sure they are ready for a baby! It seems like all of my friends are having/had babies. You know, even the ones I used to silently think never would. And even if I thought they would eventually, I figured I was "ahead" in that race since I was at least married and owned (er... mortgaged?) a home. Most days I still wonder if I'd be able to keep a baby alive. I worry that I won't be attentive enough. I worry that I will sleep through its cries. I worry that I'll trip walking down the steps at our house and kill us both. But other days I spend hours on Pinterest learning about the scoop on cloth diapering and making homemade baby food. I worry that when we start trying, it won't happen. Then I worry that when we start trying it will happen. I silently picture Adam and I standing over a precious little thing as it sleeps and cringe at the thought of 2:00 a.m. feedings and a kid screaming and me not being able to console it. I window shop for books about getting pregnant and prepping for kids, but then I have an extra glass of wine with dinner and think..."Nah. This is pretty good!" I'll be 28 in a few months. Seriously? How did that happen? I don't think is 28 is old.. to the contrary actually! But I always assumed that by 28 I'd either already have kids or at least feel prepared for them. I am so, so, so not prepared! Heck -- we don't even have a safe patio area yet! And then with that -- I'm back to running through my mental checklist. As my mind raced over all of these things last night, I wondered how I'd ever get to sleep. All of a sudden - as if he were guiding me - Adam inhaled deeply in his sleep and I found myself focused on his breathing. I matched my breathing to his and slowly I felt my fears and my tension subside a bit. I readjusted so that I could just lightly feel his breath on my back. Each time my mind started to race, I told myself, "Focus on his breathing. Just focus. Stop worrying and focus." My to-do list is long and it won't go away overnight. Likely, there will be quite a bit still on it when we decide to grow our family. When that day comes, I won't be the best mom in the world, but I'll make it a day at a time and I'm 95% sure that I won't kill myself and the baby walking down the front steps. For now, I'm just going to focus on breathing... on waking up to new days and new adventures and, of course, slowly checking things off my list. You sound a lot like me! Have you always had a plan-ahead and worry-about-everything personality? I'm not even 21 yet (I'm still a baby for a couple of weeks), but I'm always worrying about the future with a husband, a real job, maybe even kids?! It's ridiculous, but I can't help it. I think pregnancy isn't something you can even plan for. I think no one is ever ready for it, and you just have to figure it out as you go. haha I hope you are nesting so we can see little Florkens running around! All in due time Im sure though but in the meantime you'll have a gorgeous home so its not a bad thing either way! Oh gosh, when I was 28, there is no way I was ready for a baby, did I think about it a lot, of course. But then I wanted to be married for at least 5 years before we had kids. We still had traveling and having fun to do! Be selfish, cause that extra glass of wine or on a whim weekend get-a-ways are the BEST and probably won't happen again for us for...a while...but having kids is great. We were definitely ready when we had ours, I was 31. This is SPOT ON. We've been talking about timing a lot lately and every once in a while I get so excited thinking about cute blonde babies. Then I remember, they changed your life A LOT and they don't go back to where they came from... EVER, so maybe I should just enjoy my wine and sleeping in a little bit more right now instead of wishing, wanting, hoping. Slash, I think I'll be terrified once there isn't anything preventing pregnancy... (you know, honesty). I go back and forth between thinking I should never have kids and being excited to one day be a mother as well. Sometimes I feel like I would just ruin children, how could I possibly guide another human through life and make sure they don't end up as the bully or being bullied, there is such a small middle line with technology, am I going to be the parent that keeps their kids from the internet to protect them and cause them to hate me and have no friends or are they going to run rampant. The whole thing is just too scary, and don't get me started on the actual being pregnant and childbirth part. Even though Bryan and I have already discussed that we aren't going to have this conversation until he turns 30 (I'll be 29), I still wonder if I'll ever be ready. Everyone I know though says you never feel ready, you just eventually do it and it all works out. 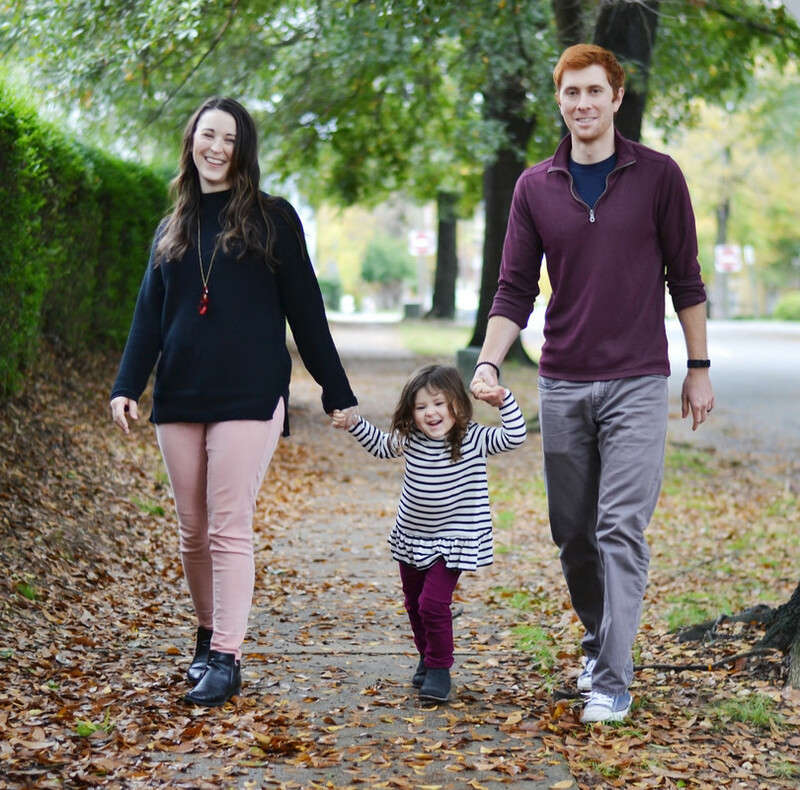 Life isn't a race and if you're not ready to have kids yet, you don't have to. However, as I'm sure other people have told you, you will probably never feel ready. There is always more to do and plan for. I am a lot like you and if I hadn't "accidentally" gotten pregnant I definitely wouldn't have had kids until my 30s if ever! I'm actually kinda glad it happened this way though because it forced me to be as "ready" as I could be instead of me having to stress about it and plan for the perfect time (well, who am I kidding, it's still stressful but since it's happening and I can't stop it, I choose to ignore the stress -- no sense in worrying about something that WILL occur -- I am choosing to enjoy this time and roll with the punches). Another thought: My best friend is married and has a house... I'm not married and I barely qualify for an apartment lease. But I'm having a baby and she wishes she was pregnant! We're all going at our own pace. Age is just a number and we all have our own unique journeys... concentrate on enjoying the one you have and if you're meant to have kids it'll happen when it's supposed to :) xo! We haven't even moved into our house yet, and we've spent two months doing projects and I already have almost two pages of lists!!! This is so pretty much exactly how I'm feeling too. Like, I think sometimes that we are in no way ready for a needy little human, plus I really love sleeping in on weekends. But still in the back of my mind, there's this little voice that is getting stronger, telling me I want one anyway. I'm reaching the end of this BC pack next week and I'm torn between staying on it or stopping it to "see what happens," because the thought of trying makes it seem so much more real! In the meantime, I just try to go about my business and no worry about when is right, but it's that stage where it's like, I think I want one, but then again I don't...but I do, but I don't...Gah! I feel like you got in my head and put my thoughts in to words. I just turned 27, my husband and I own a house and have been married for a year now...together for almost 7 years. I feel like we are at the stage where we "should" be having kids. And we know we want kids eventually, but I always feel like I need to finish every project before I can even think about it. I worry about the school district we live in and if our house is big enough...I'm scared to be a mom and not be good at it. I know that we will be fine when our time comes to have kids, but I totally understand everything you are saying...Just know you aren't alone in how you are feeling! I could have written this post. Almost word for word. I keep going back and forth about timing and money and are we even ready. The biggest hurdle is being absolutely sure I want a child. There are days when I absolutely do, and there are days when I'm like "Heck no".